So what is the deal with Arizona? We crossed over from Texas to New Mexico on Saturday and I turned my watch back an hour for Mountain Time. No big deal. Then we crossed into Arizona. Again, no concerns. Sunday morning we were up early in Flagstaff hoping to get to Grand Canyon before morning was gone. I checked the time and it was 6am so I thought we would grab a bite to eat from the breakfast bar at the Ramada before heading out. We got to the lobby and it was deserted. I asked the guy where that fancy breakfast was that they told us about the night before. He responded, "You're early. It's only 5 o'clock." 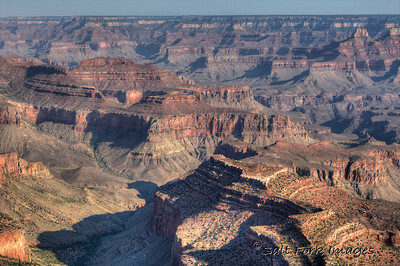 It turns out that Arizona doesn't observe Daylight Savings Time. What is up with that? The time on the clock didn't really matter to us. The sun was up and it was time to roll. 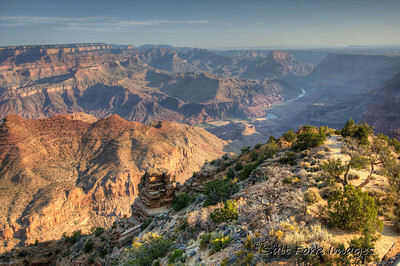 We arrived at the East Entrance to Grand Canyon National Park about 6:45am and stopped first at the Desert Overlook. Here's a shot. 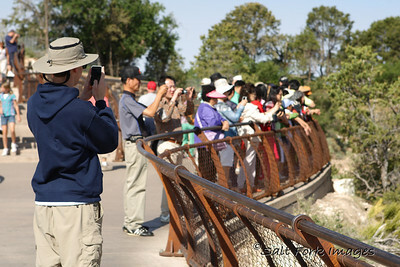 And here's a shot of Aaron taking a photo of the Asian tourists. I'm not sure why. I couldn't talk him into hiking to the bottom and back so after a quick walk to Mather Point we proceeded north to Utah and the reliability of Daylight Savings Time. Note: Click twice on any photo and it will take you to the complete gallery at SaltForkImages.com.